So, of course I wanted to make one myself! 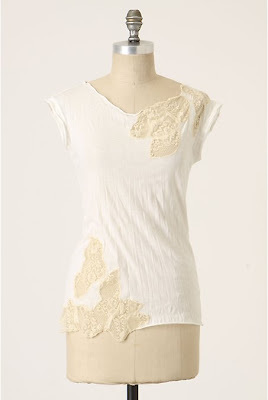 It looks so simple to just apply lace to an existing tee. I started with this nice $2.50 Forever 21 tee and an antique lace doily for the lace. It had stains on it but I didn't use the whole thing, so it was perfect for recycling into trim! I used spray adhesive to put the doily where I wanted it and cut it into wedges of the right size and shape. Then I sewed it down on the strongest parts of the lace. 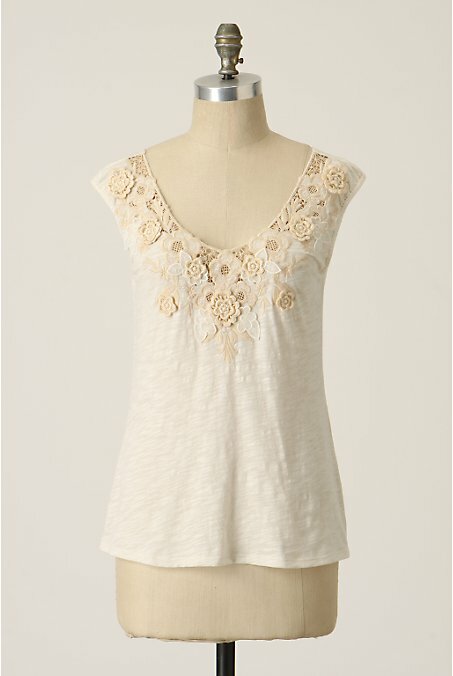 I could have left it at that but I chose to do the cut-out thing, and cut out behind the free parts of the lace, kind of like on the first two Anthropologie tees I showed. Here it is! Have you done any cool lace-trimmed projects? This is for sure a cool idea. Oh and hey curious to know, if you have had a chance to use any of the 80lbs of patterns I sent to you?? So pretty! I'm going to be doing this at some point soon for sure! Awww, that is soo adorable! :) I really love it. 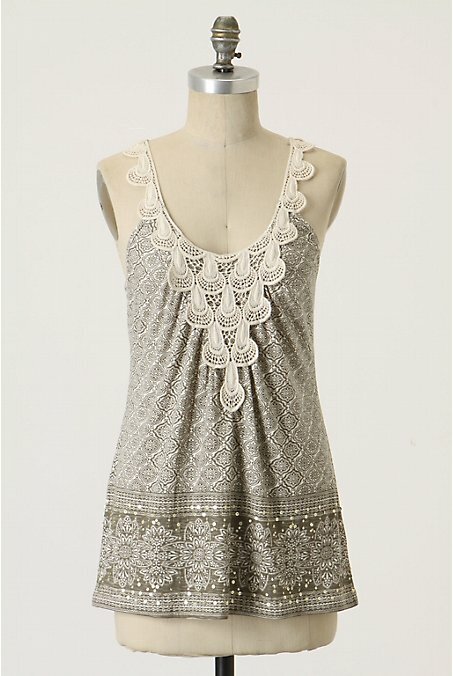 It's lace so it looks all girly, but it's asymmetrical so it looks modern. So fabulous! Love it! I too am a refashionista :) I have a lovely vintage square doily that i'm saving for the PERFECT project. As for today I'm adding Lace to the edge of a skirt a la Anthro style. That's fantastic! I have these old crocheted sofa arm covers (they were my grandmother's) that would work famously. As to whether I can actually bare to cut them up is another story. Wow this is amazing! I did lace on a shirt a couple weeks back. Check it out! wow that looks nice, and what a good idea. You really inspire me to think out of the box---love all of your projects. 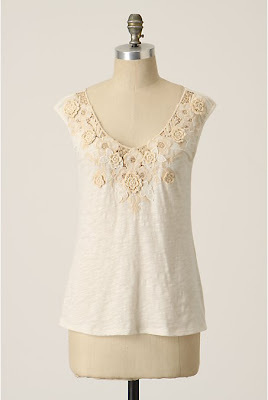 I put plain old joann's doilies on the neckline of a target shirt a while back. But I love the way you embellished the bottom as well- really cute! Very Cute! The price is right and you can be proud you did it! Awesome idea, I have a bunch of vintage lace handkerchiefs that I can't just keep stuffing in a drawer anymore, this is an awesome idea for getting use out of them! i'm making a wedding dress right now with a lot of doilies, lace, and vintage trims. its a lot of fun. i'm not crazy about the cut outs...too much skin for me, but great inspiration! That looks so amazing. No one would ever guess you didn't drop $100 on that at one of your favorite stores (mine too!) I might just have to do this- tomorrow!!! Thanks for sharing all your great ideas! Yes - I have just dona a super sweet bag with lace doiley on edge (keep getting asked where i bought it:-) ...and also pin cushion from denim and lace (for denim needles) which is j'adorable. I am mid-way through a couple of larger repurosing doily projects too -- bunting and others. I love to put lace on things, too! Yours are very pretty.